How do I add a new OS user in Linux? 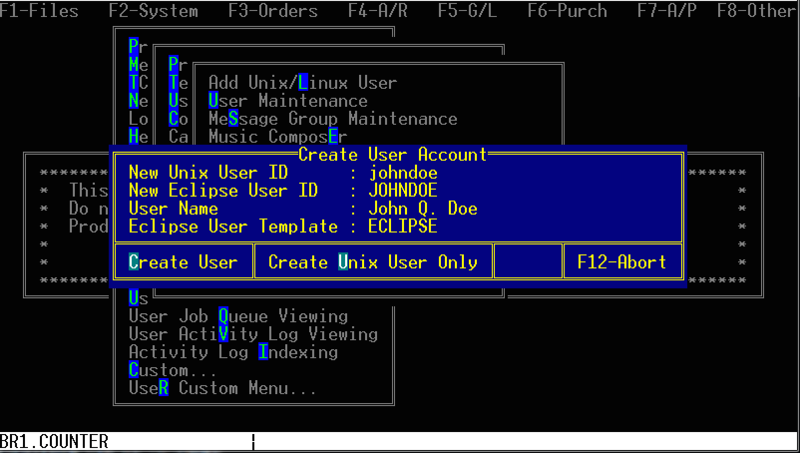 From the “F2-System” menu, select “System Files…” (F), “User Control…” (U), and finally “Add Unix/Linux User” (L). Enter the details, as shown in the example below, and then select “Create User” (C) to create the new user in both Eclipse and the OS (or select “Create Unix User Only” (U) to create only the OS user for an existing Eclipse user). The new user may now login to Linux using their new account. The first time the user logs in, they’ll be prompted to set the Linux password, unless you first manually set the user’s password or set it to blank/null. As with every command entered when performing system administration tasks from a command line, syntax is important. Please make sure that every character is entered exactly as shown below. To avoid common syntactical mistakes, we recommend you copy and paste the entire example commands into a text editor, make the necessary changes, and then paste the resulting commands into your terminal session. NOTE: in the example below, we are adding a user with the username “johndoe.” Replace “johndoe” with the username you wish to add to the system. NOTE: if you attempt to set a weak password, you may see a warning. If you are willing to accept using a weak password, simply type it in again and confirm to proceed. If you would like to create a user with a blank password, please see this article. Important: please verify that the order of arguments in the command is correct: /u2/eclipse/.profile must come first, followed by a space, and then the new user’s profile directory. Important: please note there is a space between the source and destination locations. Open Eterm and log into the server using the newly created username and password. If you added the user correctly, you will be presented with the blue Eclipse login screen. If you’re still not able to log in using the new user’s credentials, please open a support request, and the Eclipse support team will provide assistance. The instructions on how to set the os user to have no password is no longer here. You may want to put it back. A link to the appropriate article has been added. Is there any way to to this through the gui anymore or does it have to be through the cli now? You will need to use the command line to create the appropriate symlink. You may use both the GUI and command line if you want. Is there a way to create a new user with a blank password from the GUI? Thanks. There may be, but it’s an exercise left up to the reader — so to speak. Previous Previous post: How to I remove an OS user from Linux? Next Next post: How do I manage Linux print queues?